Comparing elderberry shrubs to viburnum shrubs in the previous post would have made a lot more sense if a photo of Viburnum leaves were included for proper identification. 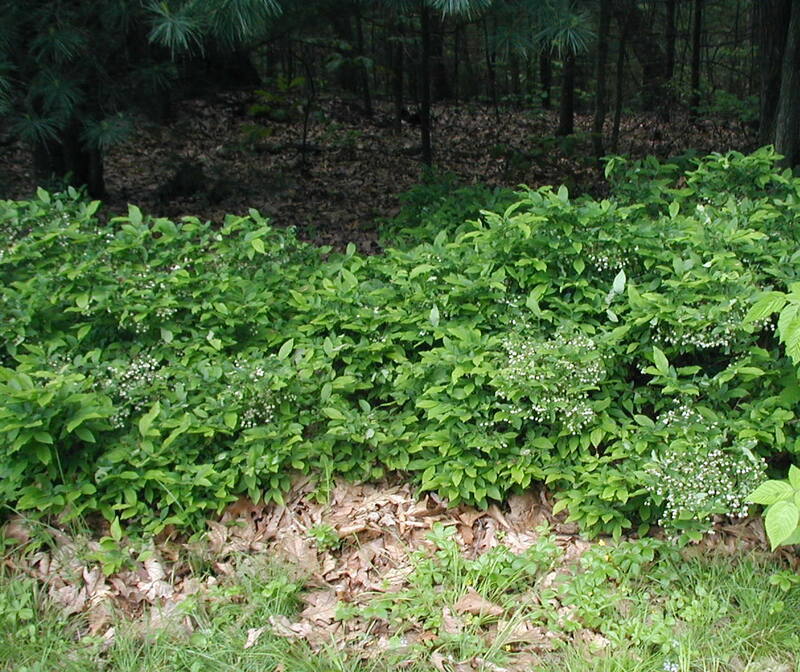 The compound leaves of elderberry have 5-9 serrated leaflets. 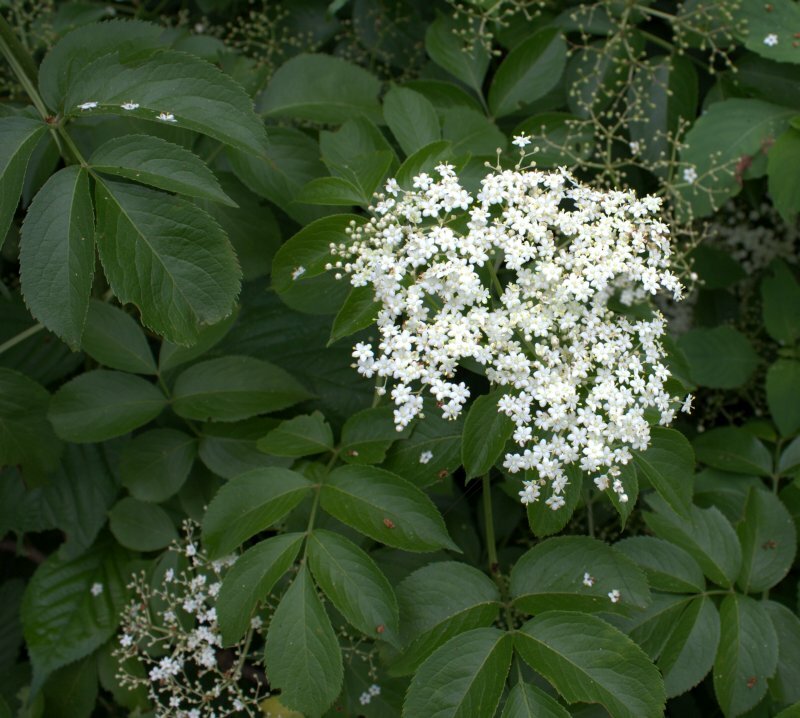 Elderberry leaves have several pairs of leaflets with serrated edges. 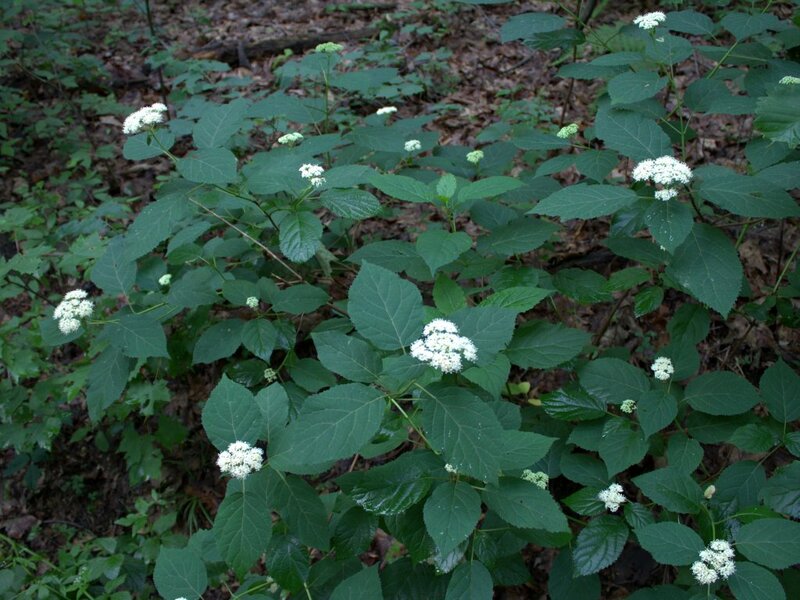 I found a Viburnum species blooming at Boyd Big Tree Preserve near Halifax, PA. We can tell that this little shrub is a type of Arrowwood by the shape of the toothed leaves. 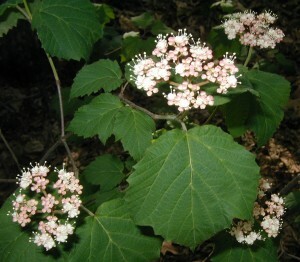 The simple leaves of Viburnum spp. are opposite and entire, toothed or lobed. 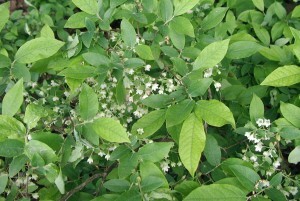 An Arrowwood shrub blooming at Boyd Big Tree Preserve Conservation Area. Photo taken 26 Jun 2014. 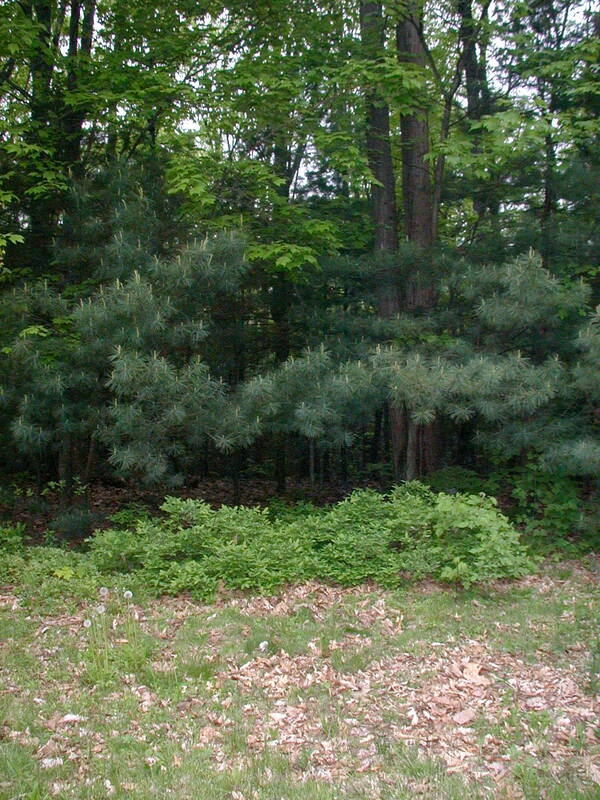 If the foliage were more closely inspected perhaps we would know if this is Northern or Southern Arrowwood. 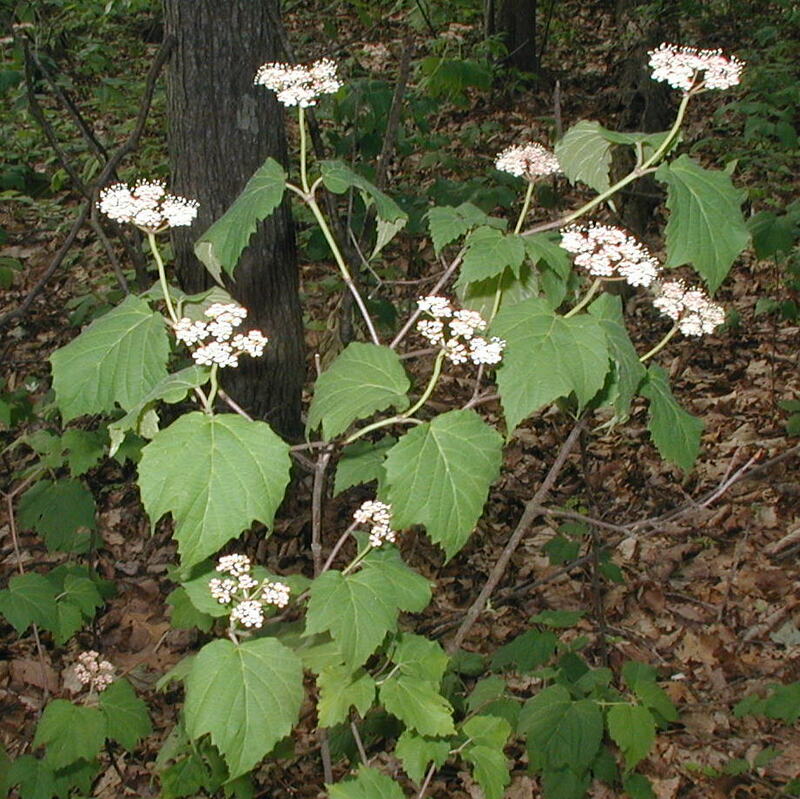 The one feature that distinguishes the two is that twigs are hairless in Northern Arrowwood, Viburnum recognitum, and velvety-hairy in Southern Arrowwood, Viburnum dentatum. 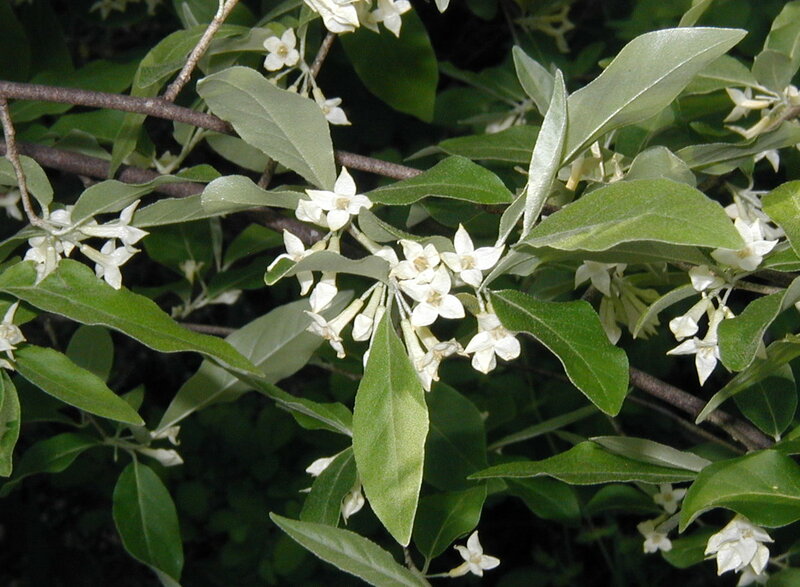 Details for identifying shrubs, like their leaf shapes, degree of leaf hairiness, or the absence of hairs on small twigs, can be found in Peterson’s Field Guide to Trees and Shrubs . Close-up views of the twigs suggest that the specimen photographed above was an example of Southern Arrowwood. 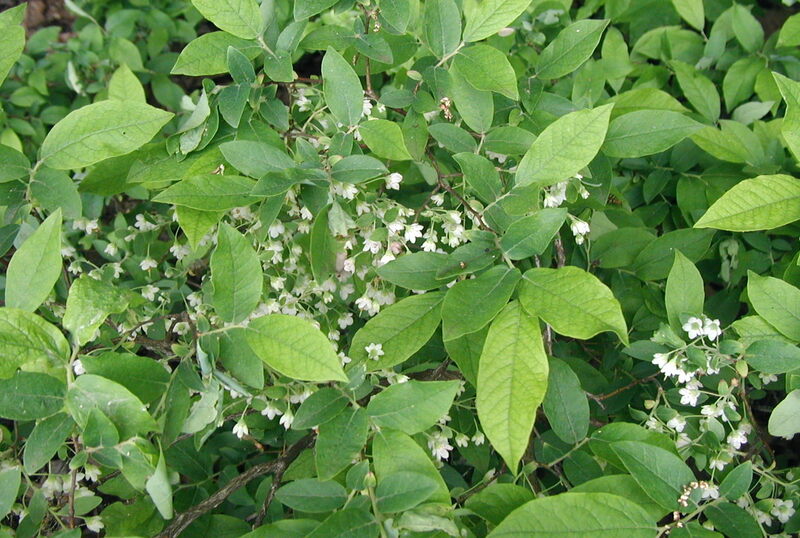 So remember, if you’re seeking elderberries the compound leaves will verify that you’ve got an elderberry shrub, while simple leaves will tell you it’s a viburnum. 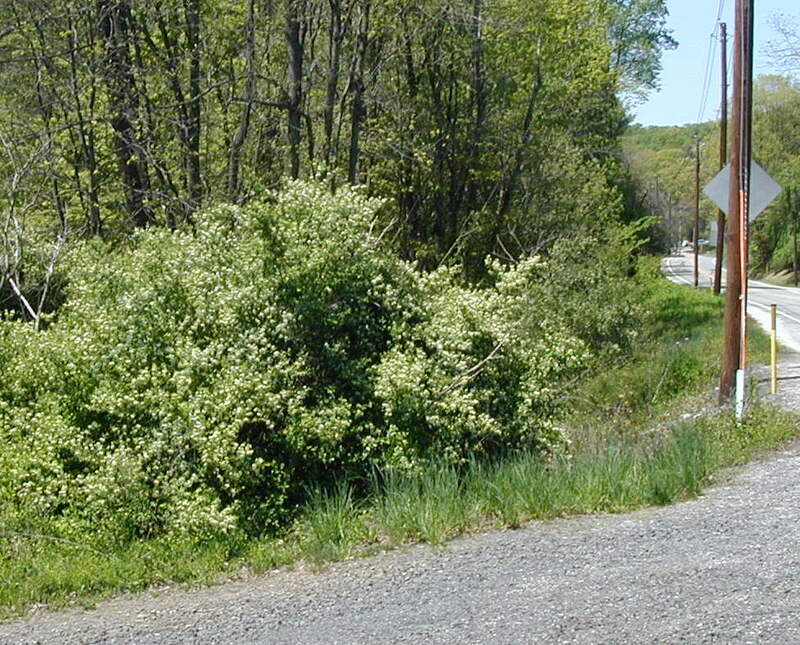 Maple-leaved Viburnum, Viburnum acerifolium, started to bloom around the middle of May here in South-central PA. It’s a woody shrub that can flower from a single stalk as a young plant. 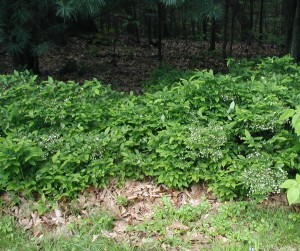 When this viburnum gets a little older, it may flower profusely with clusters at the ends of each branch on the larger plants. Clusters of maple-leaved viburnum flowers. 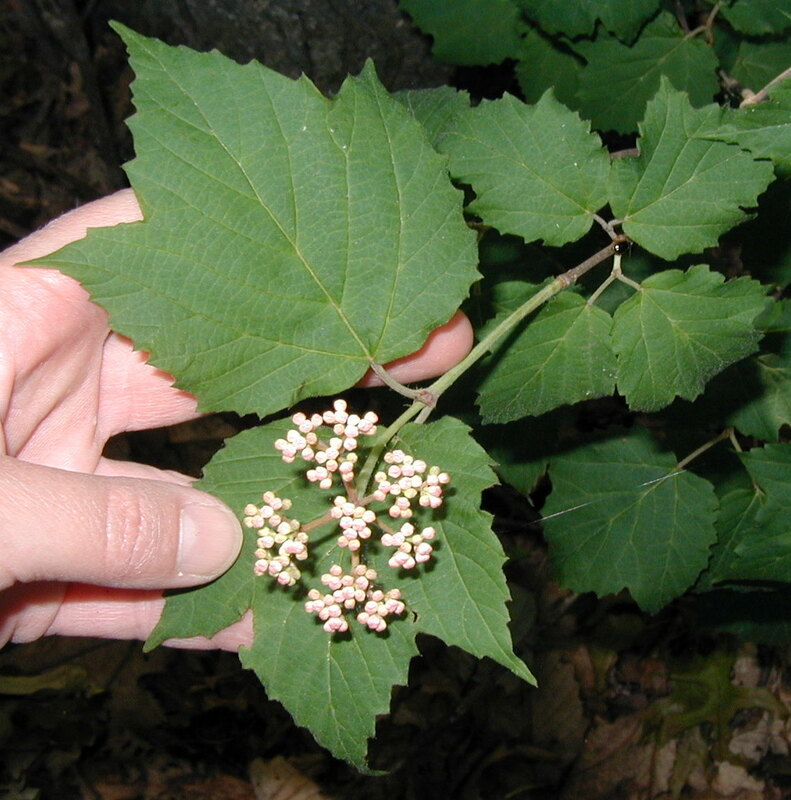 Flower cluster and leaf of maple-leaved viburnum. Flowers occur in flat-topped clusters at the branch tips. 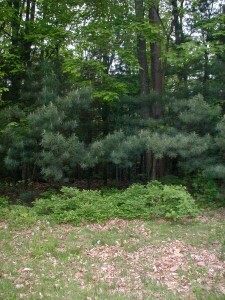 Leaves are similar in shape to maple tree leaves, thus giving this understory shrub its name. 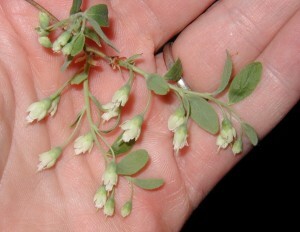 Flower buds are pink to white in color, while the inner flower parts are mostly creamy white. Pink flower buds of maple-leaved viburnum. 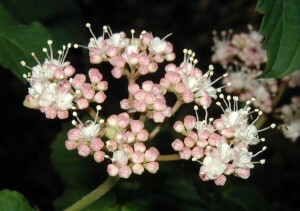 Pink flower buds of Maple-leaved Viburnum open up into white flowers with long stamens projecting upward. Anthers on the tips of the stamens make the flower clusters looked dotted. A few viburnums listed in Peterson’s Edible Plant Guide are edible, but others in the Viburnum genus have bitter fruit. No medicinal qualities were noted in Peterson’s Medicinal Plants Guide . 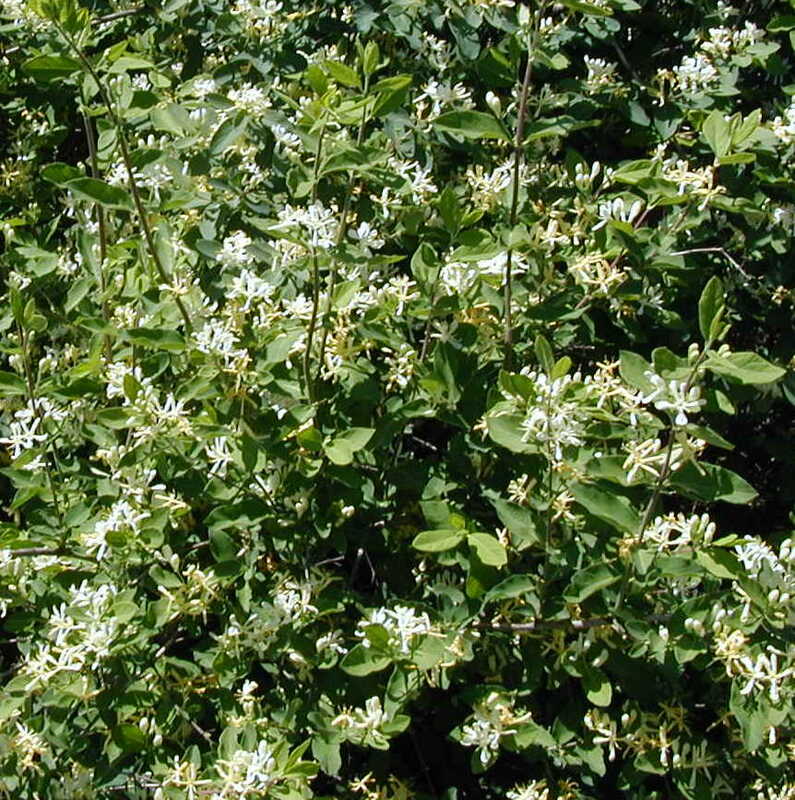 Honeysuckle is a sweet treat that many of us remember from our childhoods. Taking the blooms off the plant and sucking the honey-sweet nectar was fun and exciting. 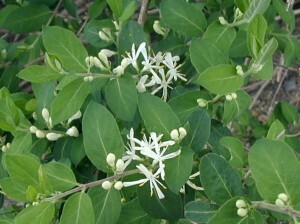 The scent of honeysuckle is heavenly and used to our delight in perfumes, soaps and air fresheners. Nature is peculiar in all its variety. Did you know that there are some honeysuckle plants that don’t even smell? 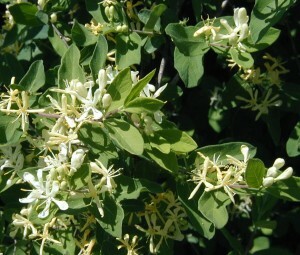 The blossoms look practically the same as the deliciously scented Japanese Honeysuckle, Lonicera japonica. 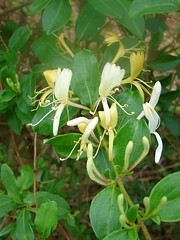 The Japanese honeysuckle is a vine with pairs of white flowers that fade to yellow. 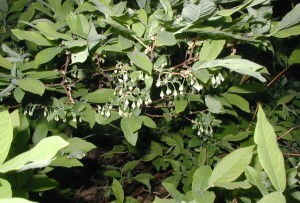 A group of honeysuckles, called Fly Honeysuckles, are shrubs that are related to the Japanese Honeysuckle. The flowers are tubular with five lobes and they project from the leaf axils. The evenness and length of the flower lobes helps to separate the species of honeysuckle. 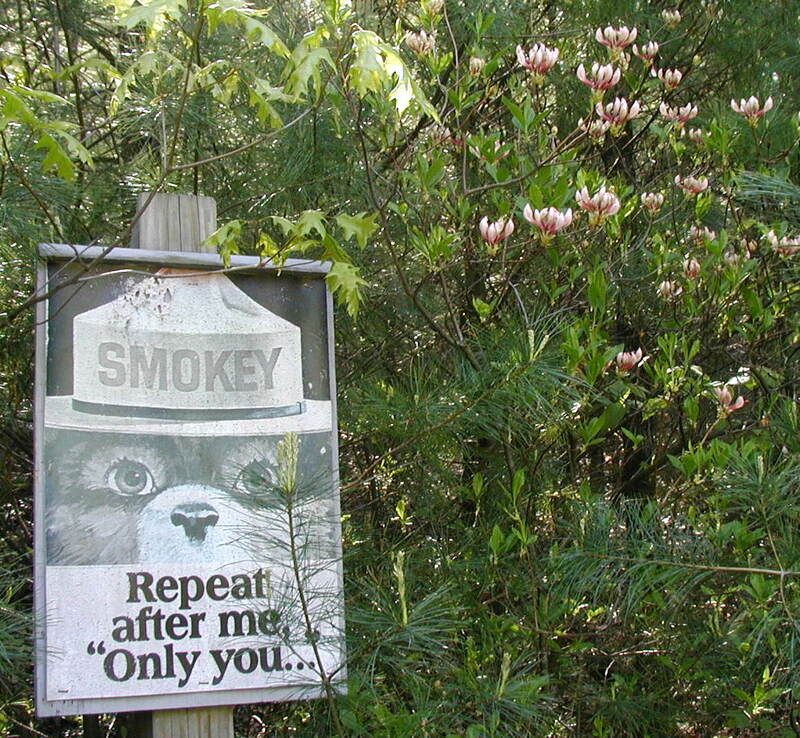 Also, the habitat where the plant lives will help to distinguish it from its relatives. The Newcomb Field Guide indicates that fly honeysuckles can be found in swamps and bogs, on alpine slopes, in cool woodlands, in thickets and along roadsides. Morrow’s Honeysuckle, Lonicera morrowi, is the fly honeysuckle in the photos shared here. 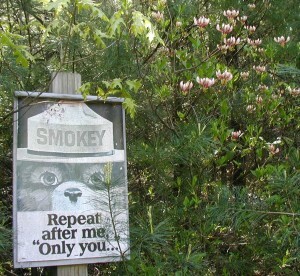 A few examples were seen flowering at the spillway of Lake Holman along Little Buffalo Road a couple weeks ago. First flowers of a fly honeysuckle blooming. Fly honeysuckle starting to bloom. Photo taken 18 April 2010. White blossoms are freshly open. Note the pairs of flower buds at each leaf node. Another example of Morrow’s Honeysuckle (on Little Buffalo Road near the intersection with Route 34) was flowering profusely on 30 April 2010. The symmetry of this plant is remarkable with its pairs of opposite leaves and two flowers per leaf axil. The oval leaves themselves are quite symmetrical. Finding this fly honeysuckle along roadsides shows its invasive character. Fly honeysuckle shrub at the side of a road. Flowers on a fly honeysuckle at the road side. Honeysuckle flowers practically coat this woody shrub. 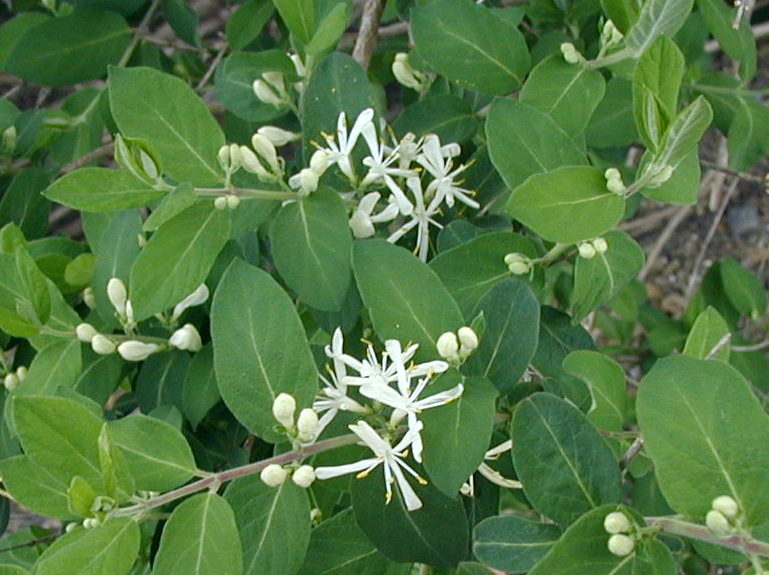 Blooms of the fly honeysuckle. 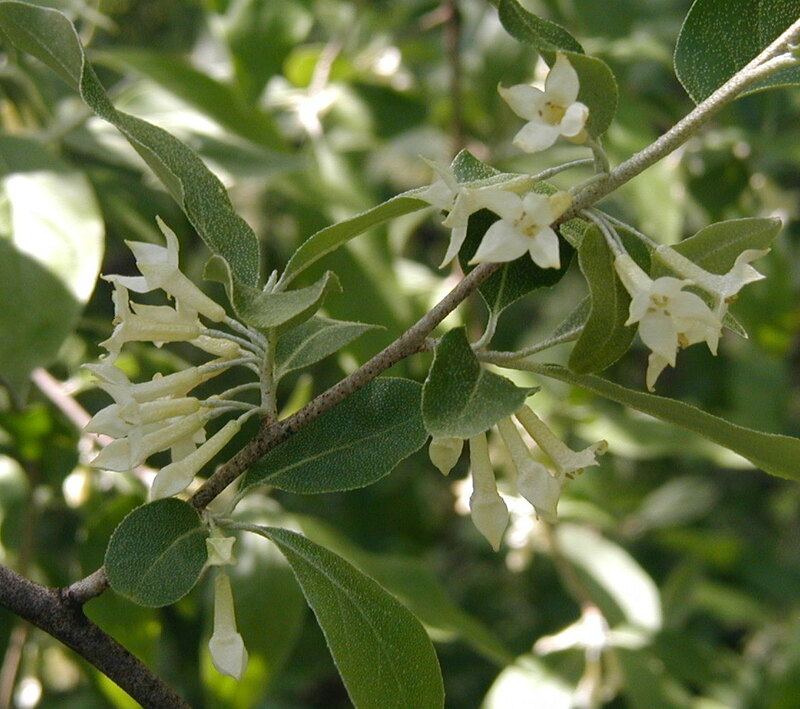 Close-up view of the flowers of dry honeysuckle shows the older blossoms have turned yellow and new ones in the bud stage are creamy white. Seeing this honeysuckle and getting close enough to realize that it was the scentless kind makes me want for summer. That’s when the Japanese honeysuckle will be blooming and filling the air with its wonderful fragrance.